* This is my article in BusinessWorld last August 21, 2018. On Aug. 16, 2018, Thursday near-midnight, a Xiamen Airlines plane skidded at the Ninoy Aquino International Airport (NAIA) and caused the runway closure for some 36 hours. The result was a nightmare for thousands of passengers. Many arriving flights were rerouted to Clark and Mactan-Cebu airports while passengers departing from NAIA were stranded for a day or two or even more as it was not easy to rebook a flight. 1. The DoTC-DTI Joint Administrative Order No. 1, s. 2012, “Providing for a Bill of Rights for Air Passengers and Carrier Obligations” — does it apply to stranded passengers in this case? 2. If not, who should shoulder at least the meals of the stranded passengers — the passengers themselves, Xiamen Airlines, MIAA, TIEZA/DoT? 3. This is not the first time that NAIA was closed due to plane accident on the runway. Were there lessons learned? 4. What are the impacts on the Philippine tourism sector? On #1, seems that the answer is No. The cancellations and flight delays at NAIA were not caused by the other airlines, they even suffered huge losses because of extra hours, fuel and other costs associated with landing in Cebu or Pampanga, and flying out with no passengers as their passengers were trapped at NAIA. Thus, those airlines may not be obliged to give free meals. Passengers who opted to cancel their delayed trips should get refunds but it takes a long time and there are standard deductions from the original ticket prices. On #2, still subject to investigation and legal debates but it seems that Xiamen Airlines and/or the Manila International Airport Authority (MIAA), as well as the Tourism Infrastructure and Enterprise Zone Authority (TIEZA), should have covered even the meals of the stranded passengers. MIAA collects P200 per domestic passenger as airport terminal fee, and P550 per international passenger, meaning the agency should provide certain services to the passengers especially for emergency cases like this. TIEZA, an attached agency of the Department of Tourism (DoT), collects travel tax of P1,620 per Filipino traveling abroad on economy or business class, and P2,700 for those on first class. TIEZA projects seem “invisible” and non-tangible for Filipino travelers, the government simply collects money from them and give the officials and personnel lots of perks and good salaries. On #3, the answer seems to be No. This is because each administration brings its own airport officials and bureaucrats, some of whom may have little skills in managing big and strategic agencies like MIAA and NAIA. On #4, the impact is obviously negative. Foreigners or returning Filipinos (balikbayan) with only few days of stay here have already blown off their vacation with lots of unnecessary stress and expenses. 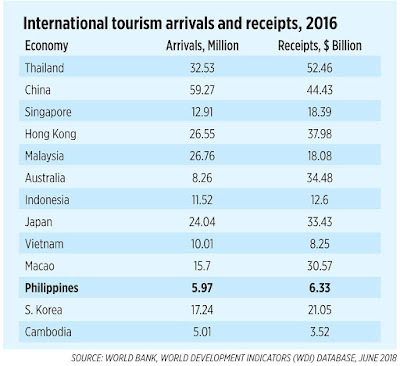 Philippine tourism arrivals in 2016 were only one-half (½) those in Vietnam and Indonesia and one-fourth (1/4) those in Malaysia. 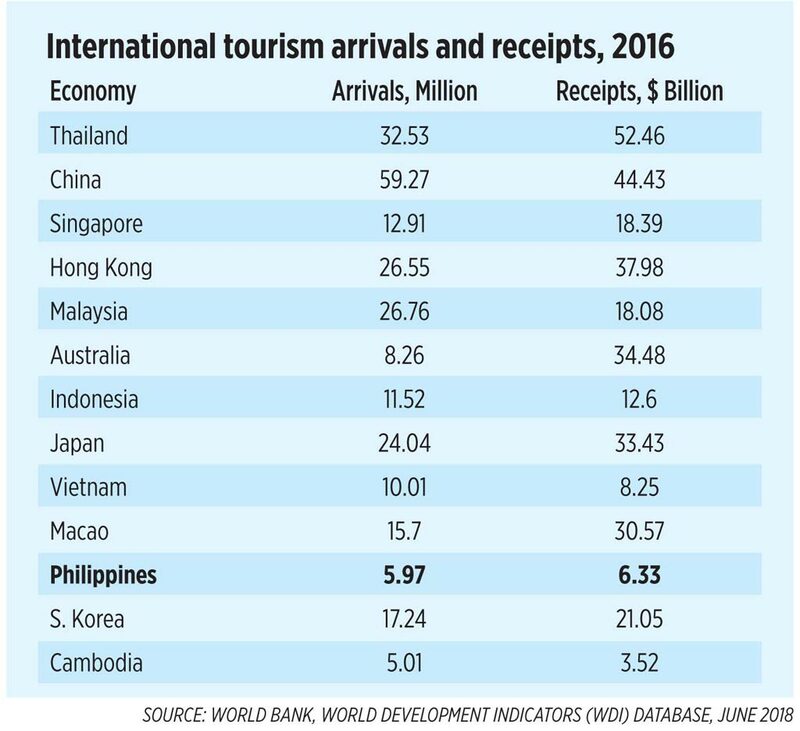 In tourism receipts, the Philippines got only one-third (1/3) that of Malaysia and Singapore and one-eighth (1/8) that of Thailand. Too bad for the new DoT Secretary, this event is a sure headache in terms of missed targets. This is on top of the ugly Duterte policy of Boracay closure for six months, April 26 to October. One, MIAA and TIEZA which are regular collectors of taxes and fees from passengers should learn to spend for the affected and often hapless passengers. Two, MIAA should be considered for privatization but the private owners-operators still subject to various regulations by government agencies like the DoTr, CAB, SEC. The purpose is to strengthen professionalism and help depoliticize the management and operation of the airport, since officers are not subject to mandatory replacement every time a new administration comes to power. Three, NAIA expansion to have a second or third big, wide runway for big planes, should be expedited. Or the creation of second and third international airports as alternative to NAIA — in Sangley Point, Cavite, and/or Bulacan should be expedited as well. Four, integrated PPP (construction then O&M to be done by the same entity) and not hybrid PPP should be adopted in NAIA expansion and/or creation of alternative airports. I am reposting another good article from a friend, Nick Smith of Lion Rock Inst. in HK. This was published in March 2018. You may not think it from my title but this piece is about the Budget. Let me explain. Human beings, when faced with the chaos of nature, crave some degree of certainty. Governments respond to that innate desire with welfare programmes, the promise to outlaw or regulate all unpopular behaviour, and other measures that promote the idea of keeping society “under control” for the public good. What, you may ask, has the budget got to do with that? Let’s take a step back from the myriad individual tax changes, Government subsidies, incentives and the other minutiae that the media tend to obsess over with any budget. The immediate news round is taken up by a litany of groups who didn’t get a handout or received too little. Our local Santa Claus never gives out enough presents to satisfy those with their begging bowls outstretched. But behind the usual post-budget noise what longer term trends can we discern? Instead of thinking about a lower tax economy, the debate and pleadings are about how the cash is spent by Government. The Government has the wherewithal to do “more” for society. The assumption is that it is a positive thing for the government to be able to spend more, without thinking that the private sector is thereby spending less, because of the excess taxes paid. In a Western economy, this focus on spending would hardly be a surprise. But Hong Kong’s reputation as a free economy has been built on low taxes and small government. These principles have the combined effect of leaving a large portion of daily life in the hands of individual choice. Moves to reduce the size of the private sector and grow the Government ought to attract a lot of attention here. 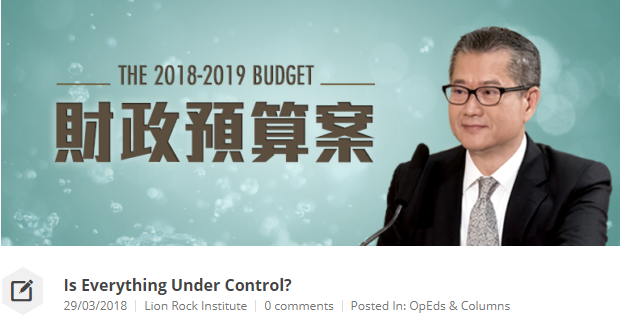 But since the handover, and with increasing frequency since C Y Leung’s tenure as CE, voices have been raised against free market principles. These voices now come from within the Administration as well as from political parties. Positive non-interventionism had already been denounced as out of date long before this budget. 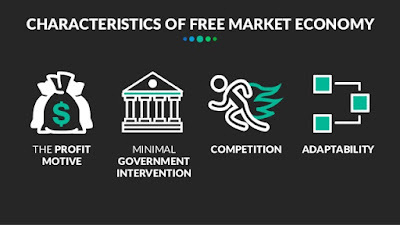 Now two more nails have been hammered into free market’s coffin. The risk that pressures would grow to increase the size of the public sector was recognised by the Basic Law drafters. A number of lines in the sand were drawn, in an attempt to provide some barriers that might help administrations resist these inevitable political pressures. I use the metaphor “lines in the sand” advisedly. Such lines can, after all, be erased by a rising tide. And a tide in favour of a bigger role for government is now creeping ever higher up the beach. Two of those lines in the metaphorical sand were that Government spending should not exceed 20% of GDP and that should not increase faster than the growth of the economy. This budget erases those lines from the sand. It does so without any expressed concern or excuses. Instead, the Administration appears to be proud of getting rid of these tiresome barriers to more Government. Yet here was a great opportunity to reassess the overall burden of taxation. A ten year projection could have been made which concluded that a balanced budget could be achieved with, say, taxes reduced to 10% on both individuals and companies. Businesses large and small could then have been able to plan investments with the expectation of higher returns. But instead of increasing the number of investments driven by private decisions, Government bureaux will guide an ever larger portion of our economy. The IT sector is a classic global example of how entrepreneurial investments can create huge value. The idea that Government committees can help decide what is “right for Hong Kong” in this area by favouring some startups over others is astonishing. Despite a hundred years, and counting, of the failure of state decisions over those of individuals to create sustainable growth, the call for Government to intervene to save us from ourselves never seems to die. Where does this perennial call come from? At the beginning of this piece I hazarded a guess. The idea that Government can take away risk, make the right choices, protect us from “bad things”, runs very deep. In economic choices this is very damaging. Governments protect the status quo and delay adjustment to change. This disincentivizes new ideas and risk taking. Yet many people crave it. Like a life-long parent, the government makes decisions, allocates pocket money, protects us from harm. This temptation; to expect Government to create a city-wide “safe space” for all citizens; is massively damaging. It disincentives accountability and self-reliance and makes it much harder for our city to adjust to change and cope with threats, because – after all – the Government does that, doesn’t it? But it cannot and it will not. We each need to be accountable for ourselves, to plan for our own futures, to take our own risks, and not think we can outsource these to our bureaucracy. As Hong Kong grew to maturity in the postwar period, these personal accountabilities were widely respected and shared. Step by step they are fading away. Someone once said “democracy dies in the darkness”, now on the Washington Post masthead I believe. However my concern is that in Hong Kong “freedom will die in the clear light of day”! Freedom can of course be lost at the hand of oppression. But it can also be lost because ordinary people ask, even require, their governments to take charge of their lives; to “take control”. Without the worry of rising taxes (and without asking for them to be reduced), many people spend their time pushing government to get involved in more and more aspects of our lives. The uncertainties of life, which create freedom and opportunity, are rejected in favour of safe spaces of all types. The ultimate “safe space” is a padded cell however. If calls for the Government to “take control” continue to grow, freedom here will wither like leaves in autumn. It is crucial that these risks are recognised and discussed in our society. Change can happen very fast. In high summer, autumn seems impossibly far away. Yet if you look closely, the leaves are already reddening. In Europe, Estonia has blossomed from a communist winter to a wonderful spring of free enterprise within two decades. Don’t think Hong Kong cannot equally quickly wither from its free market glories to a limp socialist-style economy with too little enterprise to generate the wealth an aging population will need. The announcement of a huge surplus, with cash handouts everywhere may look like the wrong time to play the fiscal Cassandra. I disagree. The leaves are turning colour in Hong Kong. Don’t assist by pulling them off the tree yourselves. 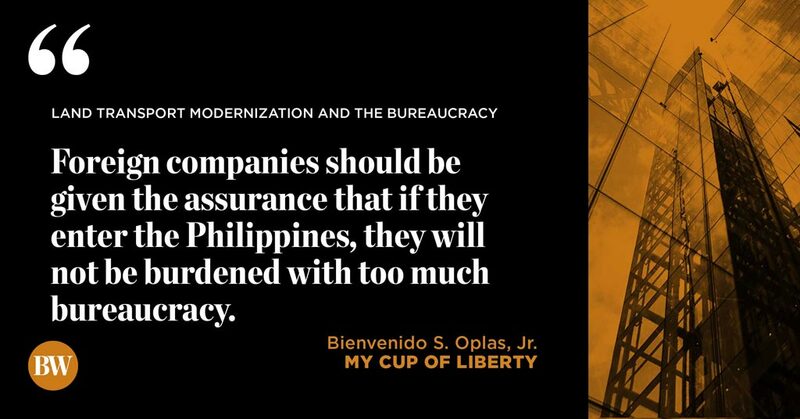 * This is my column in BusinessWorld last August 20, 2018. BBC observed that China’s radio warning to the Philippine aircraft was less courteous compared to the US Navy aircraft which also received a China military warning. The previous Aquino administration hauled China to the UN-backed Permanent Court of Arbitration (PCA) in The Hague, Netherlands. It was a good move and on July 12, 2016 or less than two weeks into the Duterte administration, PCA rewarded the Philippines with a ruling that China’s 9-dash line has no basis in international law. President Duterte, however, has never explicitly used and cited that PCA award and instead, tried to appease if not kowtow outrightly with the Beijing communist government. This policy shift was reassessed during the Stratbase-Albert del Rosario Insitute (ADRi) forum last July 12. VP Leni Robredo, former DFA Secretary del Rosario, SC Associate Justice Antonio Carpio, UP Law Prof. Jay Batongbacal were among the speakers and they highlighted the lack of importance given by the Duterte administration on the value of such arbitral award. In terms of defense spending, there is some change made by Duterte — there is marked increased in the proposed budget for the Army, Air Force and Navy and decline in the general headquarters (HQ) and other support units. Obligation budget refers to possible extension of service delivery and payment beyond the calendar year while cash budget refers to service delivery and payment within the calendar year with maximum extension of three months (see table 1). Looking at the regional picture in defense spending, the World Bank’s World Development Indicators (WDI) has some interesting data. In terms of absolute values of military spending, China is #1 hands down. 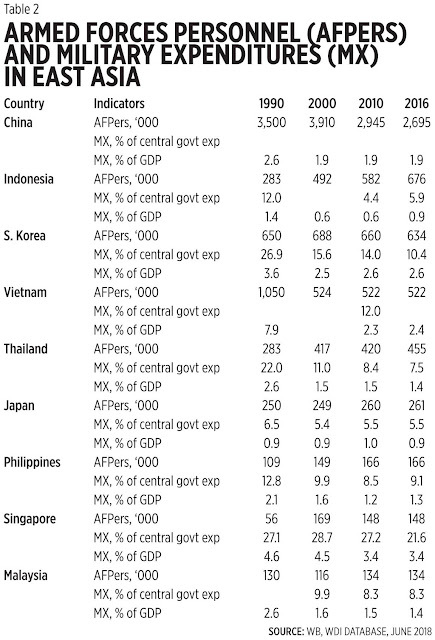 Its GDP size (nominal) in 2016 was $11.2 trillion so 1.9% of it is $212.8 B, a huge amount (see table 2). The Philippines’ military personnel and spending look small compared with its neighbors, but considering that it has little external defense capability and the main function of the AFP is internal defense like fighting the NPAs and ragtag separatist and Islamic fundamentalist groups, the spending looks big. Other Asian countries have used both diplomatic and limited military engagement in facing China bullying in the SCS. Vietnam and Indonesia, for instance, have sank some intrusive Chinese fishing boats that are sometimes backed up by China Coast Guard boats. The Duterte administration’s kowtow attitude to the China communist government is shameful. It should redeem itself by reasserting the Philippines’ ownership of those stolen islands and territories, have military coordination with the US Navy and have regular joint patrols in the area, among others. 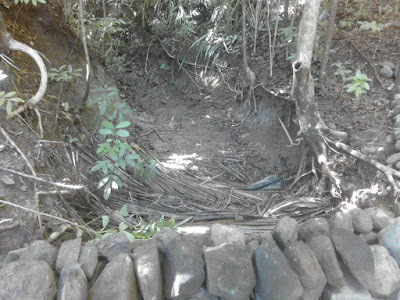 My little dam in the farm (Brgy Laguit Padilla, Bugallon, Pangasinan) is strong enough to impound water and hence, help reduce flash flood during heavy rains. 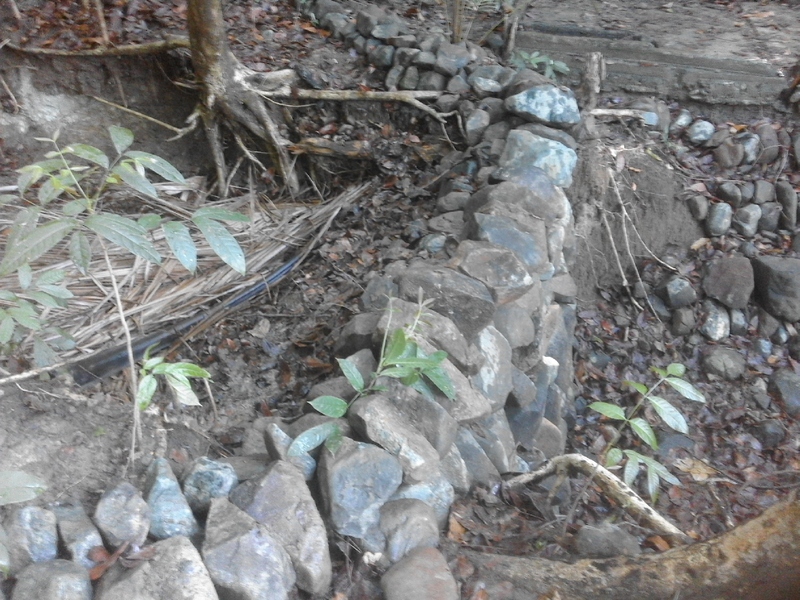 No cement and steel, only stones, sand, soil, organic matter. And no government funding, tax money or agency involved. Pictures taken last Wednesday. 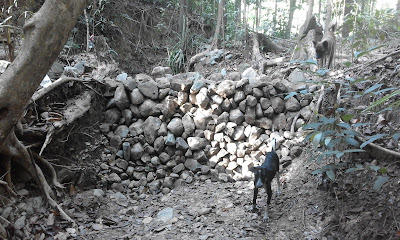 How it looked in April-May 2017. Rear view of the impounded water, picture last Wednesday. 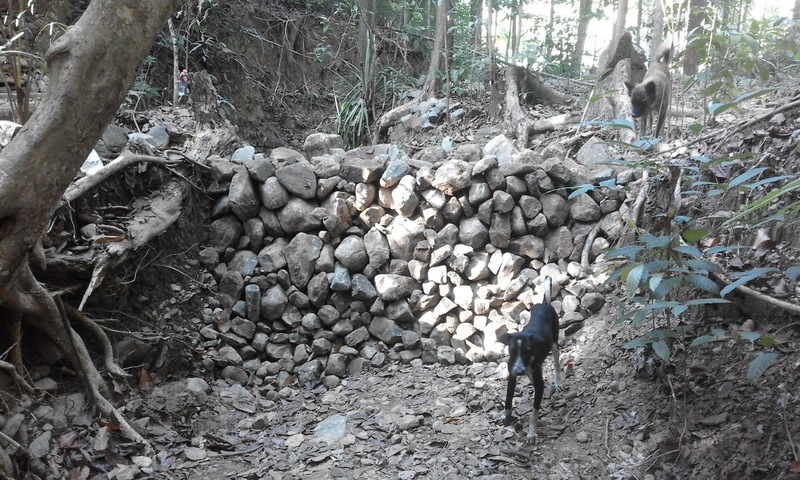 How it looked in January-February 2017. The climate alarmists shd prepare for rising creeks, rivers and lakes, not rising ocean. Lots of sick and dead people in Pangasinan flooding the past 4 weeks alone due to prolonged flooding and leptospirosis. My energy economist friend Ric has a good new article last week in Impact4all. 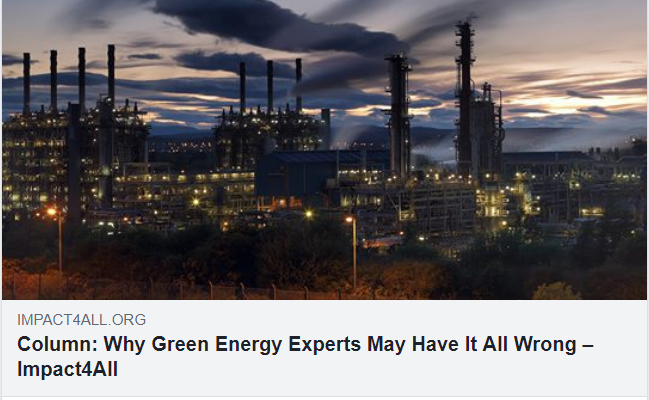 But beyond the rosy headlines, two underlying realities are being missed by policy and investors: Gas remains a viable bridge to achieving secure, affordable and low-carbon energy futures. Renewables’ futures lie with hydro, geothermal and wind, with substantially reconfigured solar and storage a later stage addition…. Today’s policy makers are looking for the silver bullet, where none exists; policy’s well-intentioned benevolence could turn its aspirations into unfulfilled promises. The remedy? A portfolio of supplies should be drawn from available resources in respective markets. Good article from Ric, as usual. I would add though that globally, hydro is good but seasonal. High capacity factor during the rainy season (tropics) and summer (N and S. Hemisphere), low during the dry season (tropics) and winter. Geothermal is geography specific, good for some countries in the “pacific ring of fire”. Wind is industry-killer nearby (no houses, resorts, hotels, industries, near those giant wind towers as those wind blades, turbines can get burned, fall down, towers can collapse). Solar is anti-green, ALL trees in and near a solar farm should be cut and murdered because solar hates shades, from clouds, rains and tall trees. Natgas is viable like Singapore is about 98% reliant on gas, Brunei about 100% gas. In Europe and N. America, gas is transported via long and huge gas pipes stretching for thousands of kilometers. This removes the need to liquify then regassify it later. For some countries far away from gas-exporters like the Philippines, imported LNG and related facilities can be costly: gas to liquid, transport by huge ships, store as liquid then re-gassify when used to fuel a power plant. Nuke power should be the most viable, very high energy density but many people are paranoid of nuke. That leaves coal power the most optimal source. Easy to transport and store because it is solid, unlike gas. A commentary by Prof. Dr. Joachim Weimann on Germany’s renewable energies flop appearing in German flagship daily the Frankfurter Allgemeine Zeitung (FAZ) underscores how wind and sun are delivering nothing of what was originally promised. Weimann describes how politicians and proponents like boasting that “much has been accomplished so far”, but points out that CO2 emissions have not fallen in close to a decade, despite the whopping 25 billion euros that are poured in through feed-in tariffs each year. 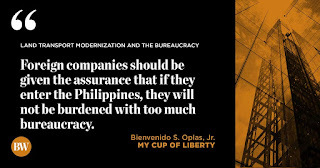 * This is my column in BusinessWorld last August 15, 2018. 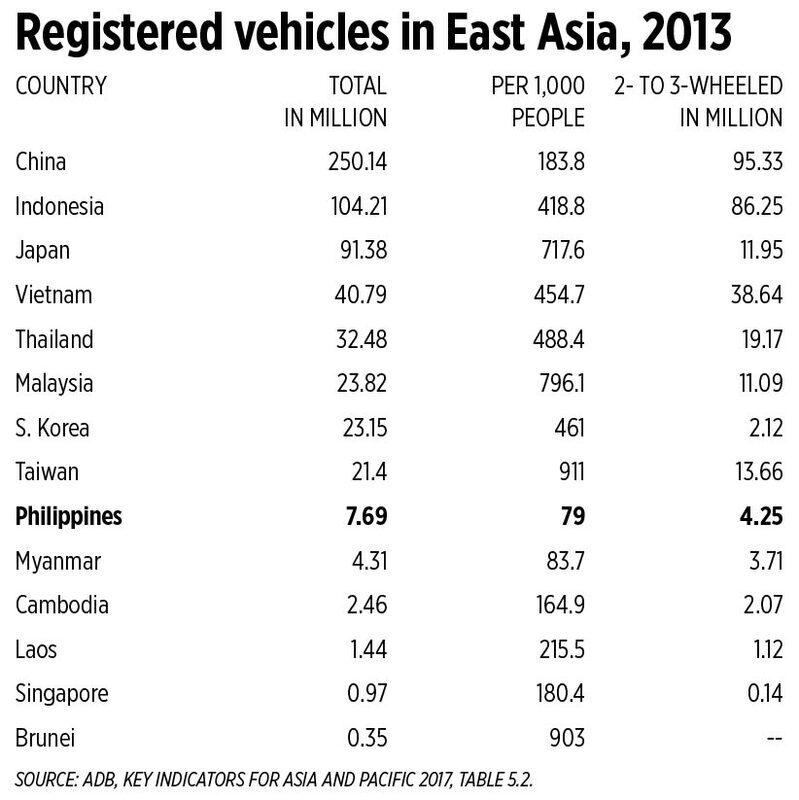 UNTIL five years ago, the Philippines had the lowest registered vehicles ratio per population in the whole of North and Southeast Asia. It only had 79 registered vehicles per 1,000 population. 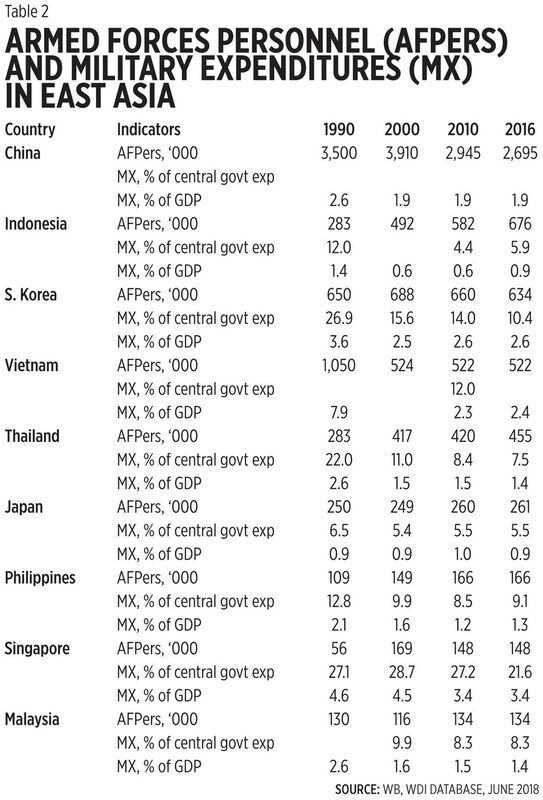 Indonesia and Vietnam had more than five times that number, Thailand more than six times and Malaysia had ten times more vehicles than the Philippines. Bulk of these countries’ vehicles though are two- and three-wheeled, like motorcycles and tricycles/tuktuk (see table). These numbers indicate two implications for the Philippines. One, our numbers were understated because many vehicles here were not registered with the government — LGUs for tricycles and kuligligs, and LTFRB for motorcycles, cars, jeeps, buses, etc. Many vehicle owners no longer bother to register their vehicles because doing so involve complicated and expensive procedures involving national and local bureaucracies. Two, the Philippines has high reliance on limited public transportation — tricycles, jeepneys, buses, UV express, MRT/LRT. Compare this with Japan, Taiwan, and South Korea. All these three countries offer convenient rail-based mass transportation but they still have high vehicle to population ratios. This is probably because vehicle owners aren’t discouraged by lengthy and tedious bureauractic procedures when they register their vehicles. That situation is far removed from the way the Land Transportation Franchising and Regulatory Board (LTFRB) regulates transport network vehicle services (TNVS) or transport network companies (TNCs). Last week, the agency reiterated its fare “rationalization and streamlining” TNVSs and TNCs. As a result, fares which it deems “non-rational” will be disallowed and in the process, innovation and modernization by private players will be discouraged. Commuters are generally rational people. 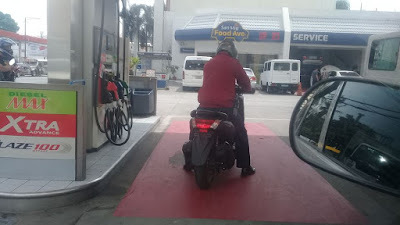 Those who choose to ride TNVS are those with specific needs, not the LTFRB officials and bureaucrats who ride in taxpayer-funded vehicles and gasoline/transportation allowance. No one put a gun to force commuters to ride “expensive” ride-sharing vehicles — they do so because they have specific needs (i.e., they’re either carrying huge amounts of cash, important documents, or equipment or must rush a patient to a hospital emergency). So when LTFRB continues with its fare control policy like disallowing per minute charging in heavy traffic or flooded streets, they discourage the supply of vehicles in those areas where demand for such transportation is high. LTFRB is the agency to penalize commuters and trap them in those areas. Also last week, the Philippine Competition Commission (PCC) has approved the Grab-Uber deal but imposed several conditions under “Commitment Decision” with high penalties for any violation. • improvement plan, particularly to enhance driver performance; adopt drivers’ and passengers’ codes of conduct; establish a Grab driver academy, welfare and rewards programs. I think the better option for the PCC is to talk to LTFRB, DoTr, SEC, etc. and ask how other big global and regional players like Lyft, Didi, GoJek can come to the Philippines and compete with Grab. Or how to hasten the merger of existing new but small players so that they become big soon and compete with Grab. If PCC makes the business harder and more bureaucratic for Grab, that is a signal for other big players like Lyft and GoJek to think twice going into the Philippine market. They put big money, time, and resources here and they can be subjected to difficult and bureaucratic conditions like what the LTFRB and PCC are doing to Grab now — why bother to invest here? Let Grab and new domestic players introduce various innovation in pricing and marketing, show the other big players abroad that if they do business here, government will not over-bureaucratize them. They will be allowed to do many things except to use their accredited vehicles to commit crime or terrorism. Government should step back from increased fare and price control and allow the customers penalize the abusive and greedy players by boycotting them and move to other bigger, more efficient players. About this "US-China 'trade war'", one good indicator is performance of respective countries' stockmarkets because these are good reflections of the degree of confidence or insecurity of market players in the economy. US DJIA vs CN Shanghai Composite indeces the past 52 weeks, until last Friday, August 17, 2018. The digression is very evident. Even more for the past 3 years, DJIA is +46.8%, Shanghai is -32.7%. Xi Jinping and the China Communist Party made a big mistake of challenging Trump. CN is a big time protectionist economy, with high tariffs and non-tariff barriers. They should have recognized it and simply liberalized their trade and investments. Now the hardship for many CN corporations and state-owned enterprises will be several times larger than the hardship of US companies. 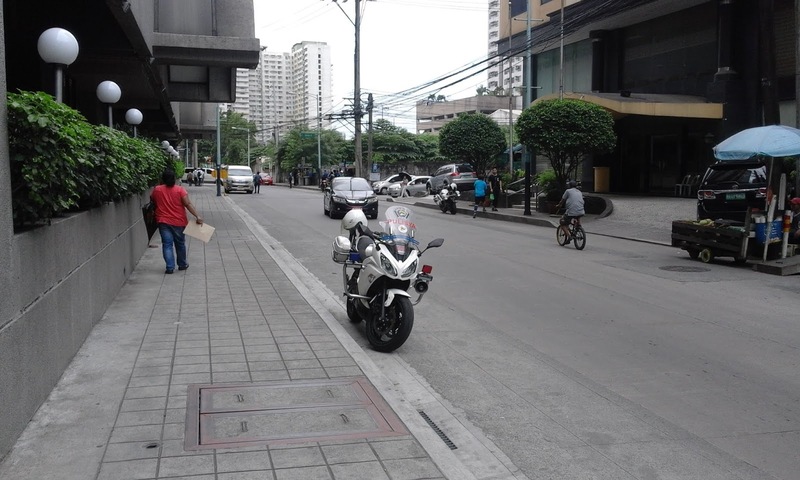 I took this photo last Friday around 2pm, Buendia, Makati City. 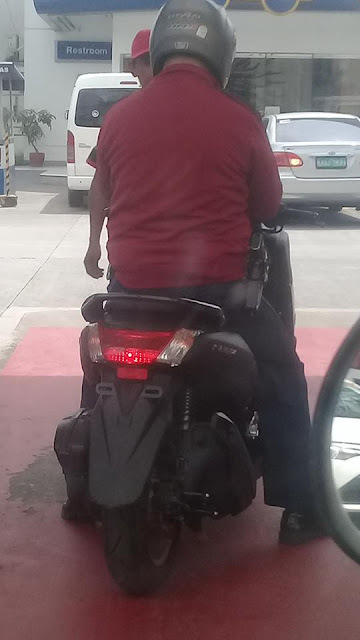 A policeman on motorcycle with no plate. A civilian doing this might have his vehicle confiscated by the police. And these are from my old albums, sometime 2016. 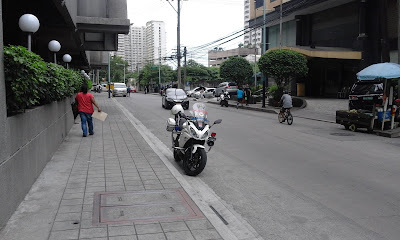 A Makati policeman parking his motorcycle in a No Parking area, front of Tiara Oriental Hotel. 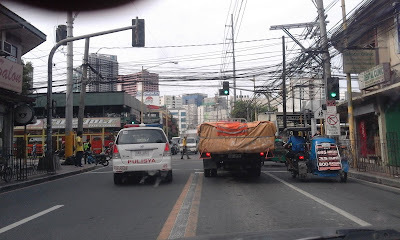 Also 2016, a police van counter-flowing then making a left turn in a No Left Turn intersection, Chino Roces-Kamagong streets. Hi PNP -- you have a very important role in society, to help preserve peace and order, to help protect the citizens' right to life, right to private property. It is important therefore that you as officers to enforce laws and ensure citizens' freedom should be followers, not violators, of the laws you are mandated to enforce without exception. I hope there will be continuing reforms to instill this in the mind of your officers, that you are not above the law. That the laws and regulations apply also to you and your superiors, not just to ordinary civilians. * This is my column in BusinessWorld on August 13, 2018. 3. Renewables firms hoping to unify lobbying efforts (Aug. 7). Report #1 is the realization of a provision in Electric Power Industry Reform Act (EPIRA) law of 2001 that an independent market operator (IMO) be created to operate the Wholesale Electricity Spot Market (WESM), which was created in June 2006. For more than a decade, the Philippine Electricity Market Corporation (PEMC) as market operator was a DoE-chaired and controlled body and hence, was not an independent entity. I attended the PEMC Chairmanship Turnover Ceremony last July 31 at the PEMC office in Ortigas. DoE Secretary Cusi has officially turned over PEMC Board Chairmanship to Mr. Jose Aboboto, one of the private industry players in WESM. Atty. Oscar Ala remains as PEMC president. The IMO technical and secretariat function will be done by the Independent Electricity Market Operator of the Philippines (IEMOP) headed by its first President, Atty. Francis Saturnino “Nino” Juan. 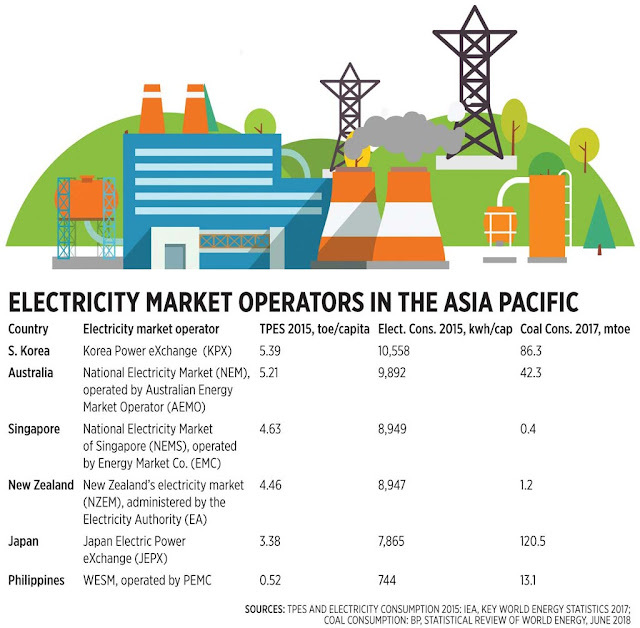 In the ASEAN, only the Philippines and Singapore have an electricity market between power producers and distributors/suppliers. 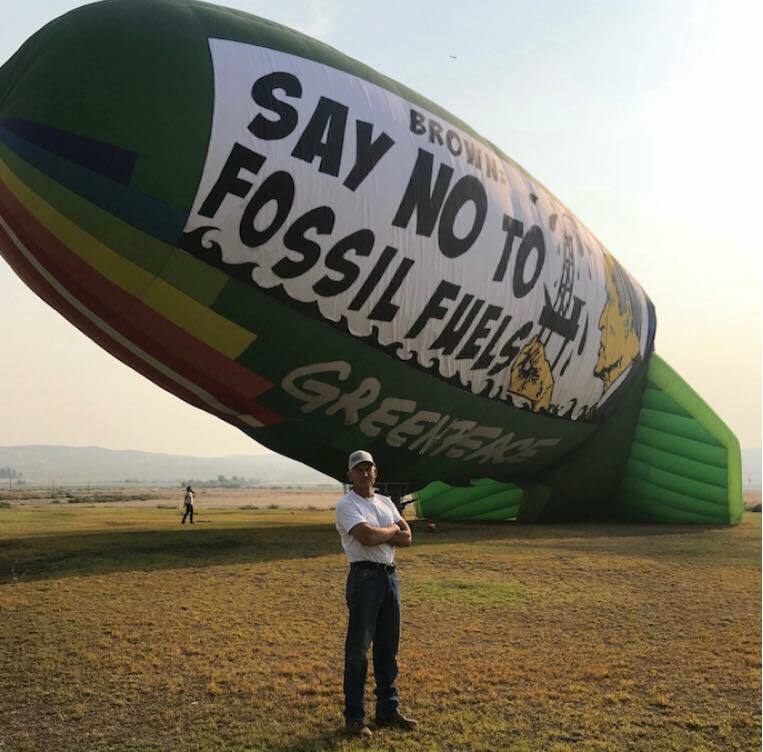 Report #2 may send alarm bells to the climate alarmism and anti-coal movement as if Philippine coal consumption is already substantial and may yet increase. Our coal use in 2017 of 13 million tons oil equivalent (mtoe) was only 1/9 of Japan, 1/7 of South Korea, 1/4 of Indonesia’s 57 mtoe, 1/2 of Vietnam’s 28 mtoe. In addition, our total primary energy supply (TPES, sum of domestic production plus imports minus exports) is also very small at only 0.52 tons of oil equivalent (toe) per capita in 2016, or only 1/10 of South Korea and 1/9 of Singapore. Our average electricity consumption is also very small, only 744 kWh per capita in 2015, or only 1/14 of South Korea and 1/12 of Singapore (see table). One can conclude that among the big reasons why South Korea, Japan, Singapore, Hong Kong, others are developed is because they have huge energy and electricity consumption. Energy precedes development that is why it is foolish to over-regulate and over-tax power generation, transmission, distribution and pricing. When power supply is huge relative to demand, there is no other way for the price to go but down, resulting in cheaper electricity for consumers. Singapore has very low coal consumption because it is largely using natural gas, about 98% of its total power generation. New Zealand is more dependent on hydro and other renewables like biomass, geothermal. Report #3 is about the fear of renewable energy (RE) developers especially wind-solar that the DoE will insist on a competitive selection process (CSP) instead of a “Swiss challenge” for distribution utilities and electric cooperatives in getting their power supply contract. Related to this is the fear of the RE lobby that their tax perks like exemption from VAT, income tax holidays, etc. will be removed under TRAIN 2 bill now in Congress. A good compromise between expensive, unstable electricity by the RE lobby vs cheaper, stable electricity by the consumers, is to have a uniform feed in tariff (FIT) for all variable REs — wind, solar, biomass and run-of-river hydro — to the lowest FIT level of P5+/kWh. Solar-wind currently get P9+ to P10+/kwh of FIT or guaranteed high price for 20 years. Solar-wind developers and campaigners keep repeating the mantra of “wind-solar technology are improving very fast, their prices are declining very fast.” If so, their high FIT should be adjusted downwards because high FIT automatically negates that mantra. If the EPIRA was implemented without distortions like RE law of 2008, we should have cheaper and more reliable electricity market in the country by now. 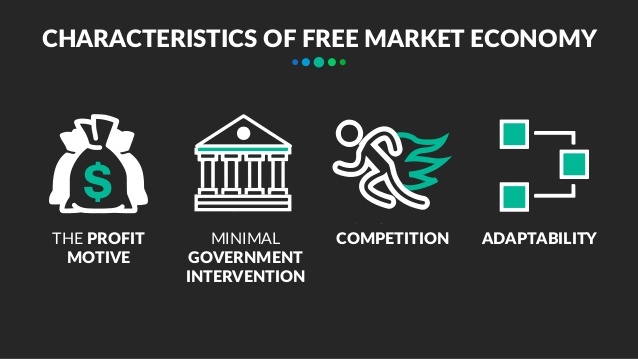 Which reiterates the fact that more competition, not state favoritism, is more conducive to the economy. 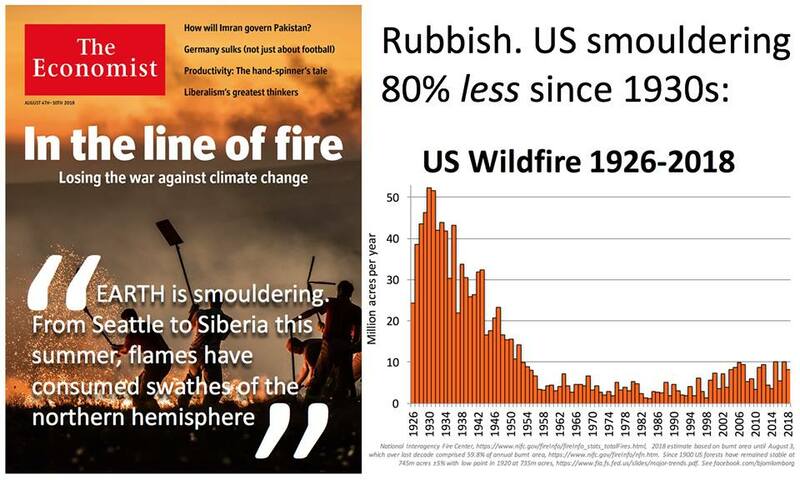 The climate alarmism movement is all about creating unnecessary or false alarm and worries to the people. They warn of “rising ocean” when reality shows that we are more engulfed with rising creeks, rivers and lakes, resulting in flooded farms, streets and villages. 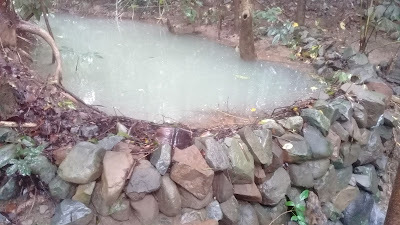 The past three weeks, Metro Manila and many surrounding provinces have experienced many days of prolonged rains known as "Habagat" or south-west monsoon. Late this week, especially last Friday-Saturday, many areas experienced heavy rains and flooding. 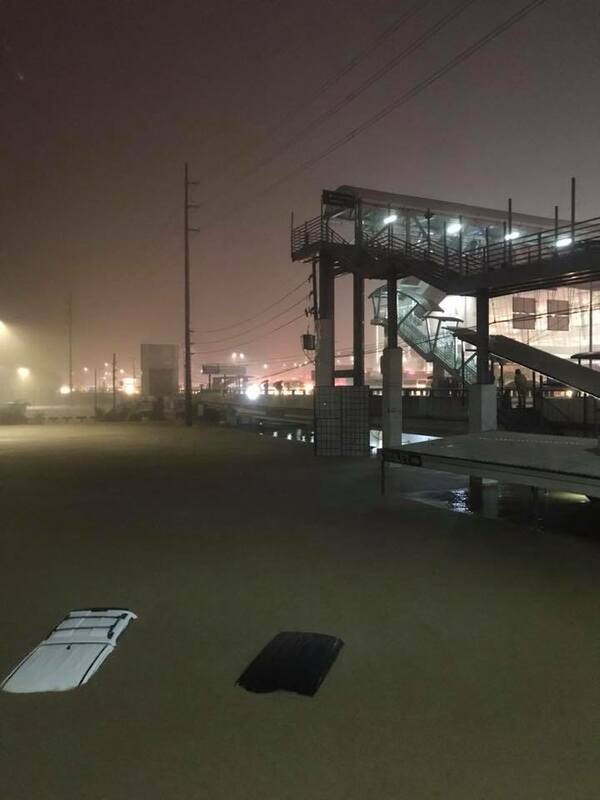 Photo here from Jaysus Reyes, 4am Saturday, SM Marikina. 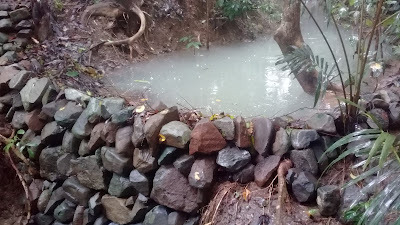 A friend posted photos of flooding in his area in Antipolo, 4am also last Saturday. 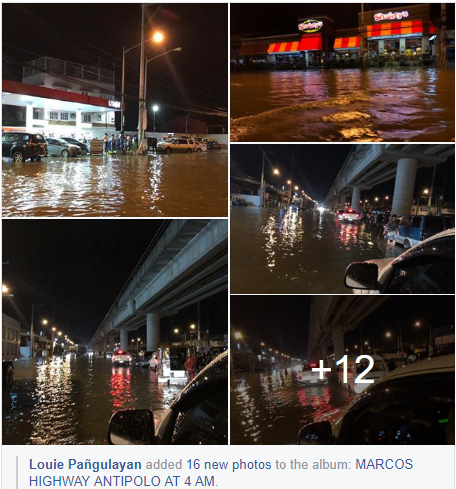 Another friend posted this morning that he was on the road, Marcos highway in Marikina for nine hours, he got home around 6am today. Recently I saw the San Carlos-Binmaley-Lingayen area also in Pangasinan. Lots of previous fishponds are now covered with soil, soon new houses or buildings will rise. Those fishponds used to be temporary water catchments during heavy rains, now they are covered by soil and cement. More flooding will be expected in those areas. 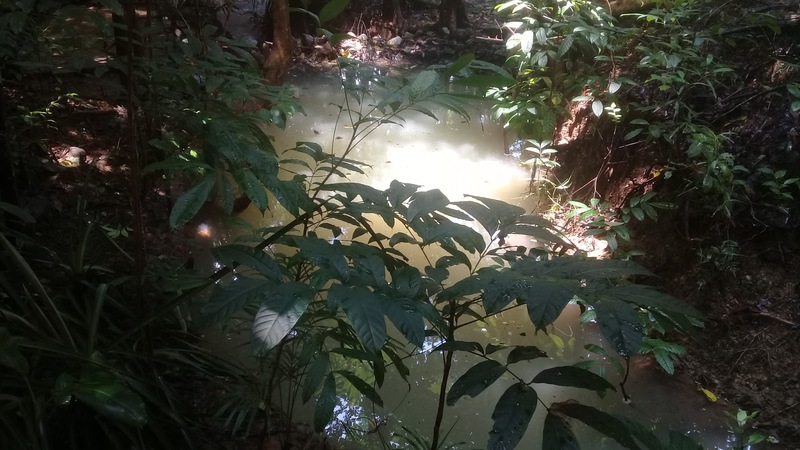 We should have sustained, regular, large-scale, yearly dredging of creeks, rivers and lakes to expand their water carrying capacity and hence, minimize frequent street flooding. This will be expensive, so we should cut or abolish funding for the Climate Change Commission (CCC), reduce DENR and LGUs’ funding for endless climate meetings and junkets. I am no fan of DOF and #Dutertenomics in their tax-tax-tax de #TRAIN but I'm their fan in their anti-federalism assessment. Go, Sec. Dominguez. Friends tayo sa anti-federalism, pero less-friends tayo sa TRAIN de TRABAHO nyo ha. cheers. "I was wrong, totally wrong. I had confidently predicted that the consultative committee would be forward-thinking and liberal in its devolution of a new, modern constitution." Yet there’s no modernizing vision: how the country can modernize its politics, economics, and culture and in the process increase the productivity of its economy"
"If government does not give our underdeveloped regions the infrastructure and time they need to develop, federalism will consign them to further poverty. This is why federalism cannot be taken lightly. This is why it cannot be rushed." * This is my column in BusinessWorld last August 7, 2013. Book II, Chapter III, p.346. When people spend above their means, they’re considered as profligate wastrels. But when governments do it — when expenses exceed revenues, resulting in budget deficits — it is simply accepted. Because many people benefit a lot from such irresponsibility — politicians, legislators, bureaucrats, consultants, suppliers, and those dependent on welfare. Congressional hearings for the 2019 budget have already started this month and the House of Representatives and Senate will deliberate on the huge P3.7-trillion budget. 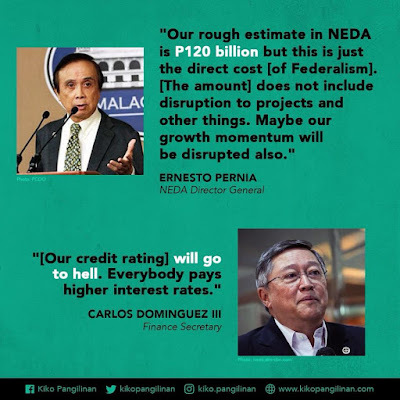 It consists of P3.2-trillion projected revenues and P600+ billion of deficit financing or debt. 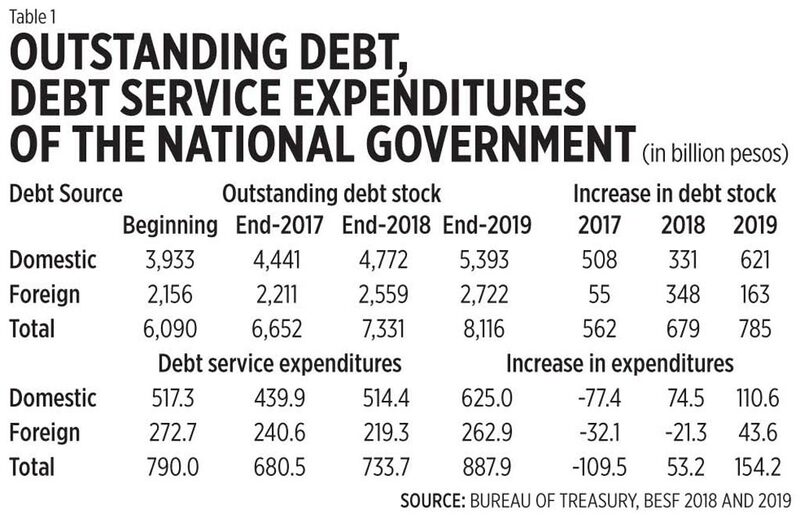 Since the Philippine government — regardless of administrations — is into endless debt addiction, the public debt stock keeps rising (P562B last year, P679B this year, P785B next year). Likewise, the annual debt service expenditures, principal and interest mixture is about 55-45% (data from Budget of Expenditures and Sources of Financing (BESF) 2019 submitted by Malacañang to Congress) also keep rising (see table 1). Meanwhile, the bulk of foreign debt payments goes to paying debt securities to cover the annual budget deficit, and not to multilaterals like the Asian Development Bank and the World Bank or bilaterals like the Japan International Cooperation Agency and the United States Agency for International Development that lend money for specific projects. 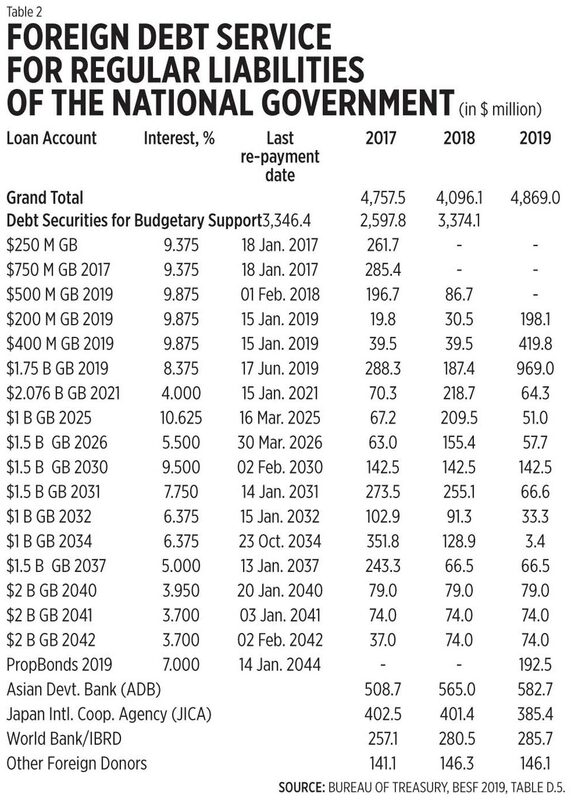 Below are some big items in foreign debt servicing. Small debt services that are below $50M like loans from USAID, French Protocol, KFW (Germany), and PL 480 are not included here. 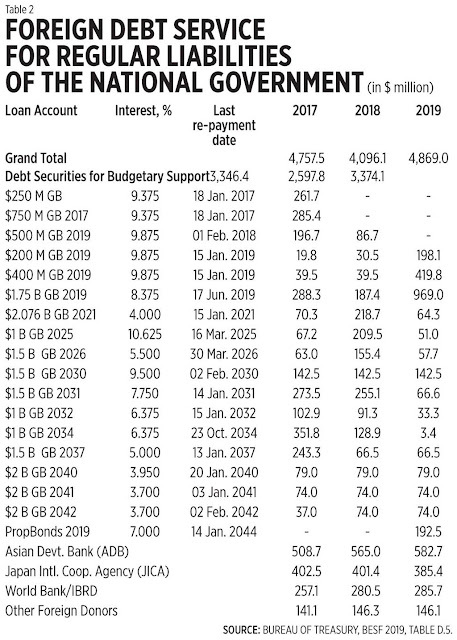 Debt securities have high interest rates, which can reach up to 10.6%, unlike those from multilaterals and bilaterals, which only range from 0.1% to 5% (see table 2). 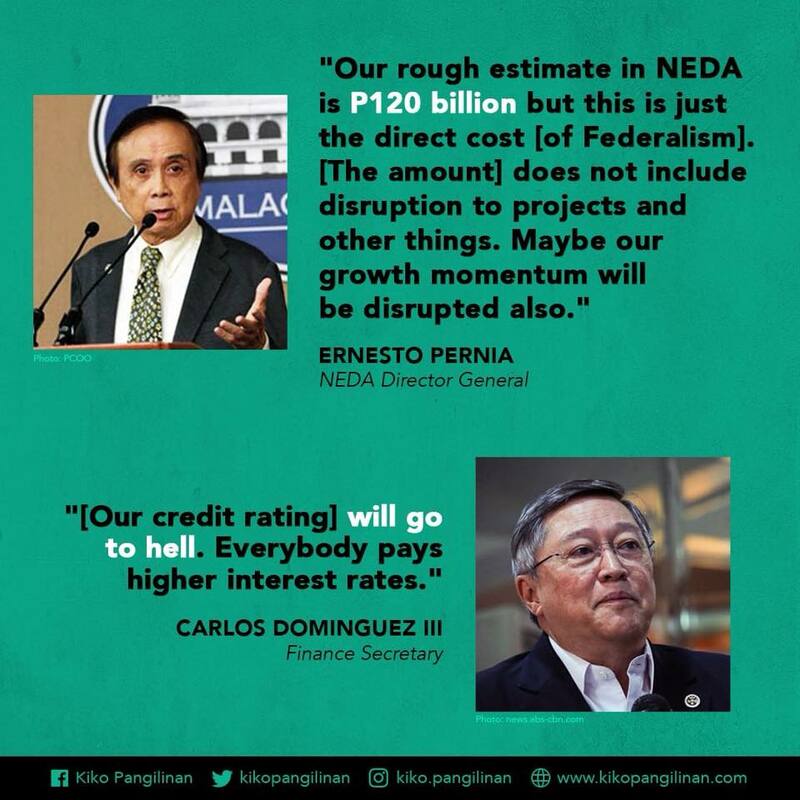 All administrations including the Duterte government have the usual alibi — look at the debt/GDP ratio, around 40% and it’s sustainable, not the total debt stock. The alibi looks cute and innocent except that the numerator, public debt stock, is debt by the government alone while the denominator, GDP size, is the flow of goods and services produced by mostly people in the private sector, households, and private enterprises. A continuing budget deficit and addiction to debt are unsustainable. The people should remind the politicians and legislators from the President down to local governments that having big tax cuts is better than endless big spending and borrowings.